A glorious spell of winter sunshine greeted more than 30 Exeter University students on a field trip to Wheal Jane last week. 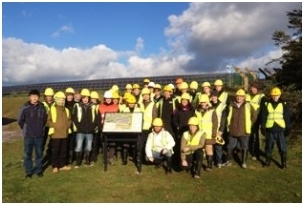 The visit was arranged to coincide with the Solar module of the 3rd year undergraduate groups Renewable Energy degree course at Tremough Campus. Getting up close to a major operating solar PV installation and hearing the sound of power being generated in the inverter station were undoubtedly the highlights of the visit. Wheal Jane Director Bernard Ballard escorted the group and gave a talk on the site’s development as an Earth Science park and the role and integration of the various renewable energy schemes planned for the project. Justin Hinshelwood, Renewable Energy lecturer at Tremough and organizer of the trip commented ‘The vision of an Earth Science park developed through the remediation of a tin mine is truly inspirational and the integration of renewable energy technologies demonstrates forward thinking both in terms of the environment and for Cornish industry and jobs’. ‘The solar farm at Wheal Jane shows that solar electricity generation can provide a viable and significant contribution to a clean energy future. We are fortunate that Cornwall provides such a fantastic setting to study renewable energy technologies because of the favourable solar, wind, marine and geothermal energy resources’. Wheal Jane welcomes student groups and has in fact hosted 17 visits by student and other groups during 2012 raising the site’s profile hugely within the local community. Bernard commented ‘Wheal Jane has many aspects of interest to students including not only renewable energy but also geology, mining and minerals, remediation, planning and economic development to name just a few’. ‘The size of this year’s group clearly demonstrates the level of interest in renewable energy and in what is happening here at Wheal Jane’. Justin concluded ‘ The University of Exeter’s Cornwall Campus at Penryn has seen the rapid expansion of renewable energy teaching and research over the last eight years. This builds on our history in engineering in the mining industry through the Camborne School of Mines. We look on with interest to see the future developments of the site at Wheal Jane and are especially keen to develop opportunities whereby our students can not only learn but also contribute to these plans.